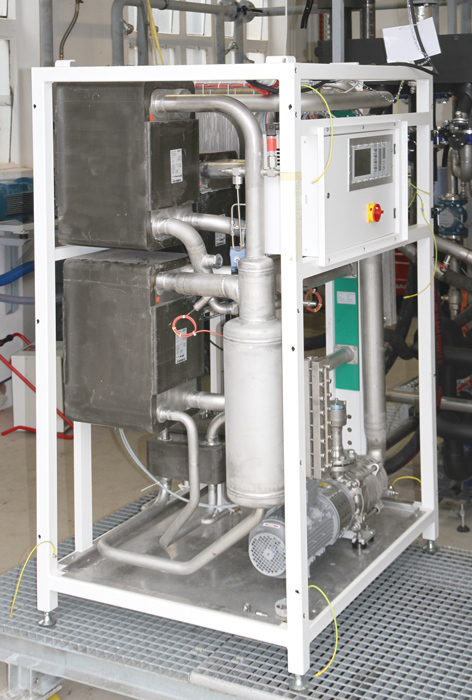 The AKM 50 chiller is a further development of our AKM 25 to 50 kW cooling capacity at the same temperature level. The first prototype has been undergoing testing on our premises since April 2016. A particularly effective, economical and environmentally friendly solution for deep cooling is provided by an electrically powered CO2compressor refrigerant that is coupled via the absorption refrigerant coolant with it or with the cold storage in a cascading way. Using the cascade, cryogenic temperature levels can be achieved close to -30°C, as is required for deep freezing in bakeries, butcher shops, and distribution warehouses, for example. We have specially developed a small refrigeration system (KKA) for peak loads that is very effective and environmentally friendly operating as an electrically operated ammonia compressor chiller and that supports the performance of the absorption refrigerant for peak demand. Using the KKA, the cooling demand at weekends, during inspections and repairs for the CHP or an exhausted cold storage can continue to be covered without interruption. The compressor refrigerator is powered by a 10 kW electric motor. It is connected to the case of the absorption refrigerator or integrated into it. A special heat pump module can also support our refrigerator by using the low-temperature waste heat of the rear cooling circuit in a cascading way to produce heat or hot water up to 80°C. The return cooling water from the refrigerator of up to 30°C is used as the source for this. This temperature range – and thus the relatively small temperature rise – allows the heat pump to work at very high efficiency; this means a very good coefficient of performance (COP) is achieved.